Jeff Bedwell forwarded reports of winter grain mites in Major and Alfalfa counties over the past week. This does not appear to be a widespread problem, but growers should check wheat fields to see if winter grain mites are present. We had a lot of issues with winter grain mites and brown wheat mites in Oklahoma last year. Unfortunately, many of these fields were not diagnosed until the damage was severe and visible from a distance. In this case, a rescue treatment was still effective at controlling the pest, but some yield loss had already occurred thus reducing the return on pesticide investment. 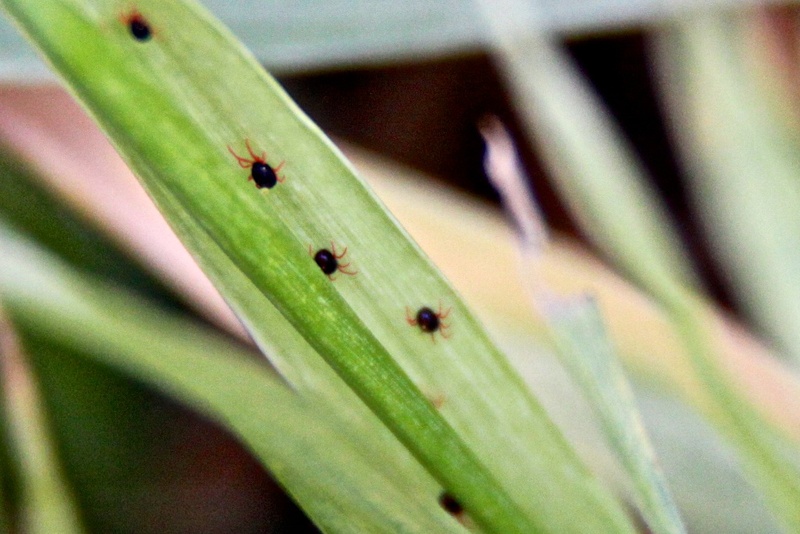 Winter grain mites are small (about 1 mm long) with black bodies and orange-red legs. Winter grain mites complete two generations per year and the adults can live for up to 40 days. The generation we are dealing with now resulted from oversummering eggs laid last spring. The second generation peaks in March/April and results from eggs laid in January/February. Winter grain mites on wheat near Blair, Oklahoma. Winter grain mites are not a problem you will notice in a timely fashion while standing up. You will need to get close to the soil surface and move residue to find these pests. Winter grain mites are light sensitive and prefer calm air to windy conditions; therefore, scouting early in the morning, late in the evening, or on cloudy days generally works best. 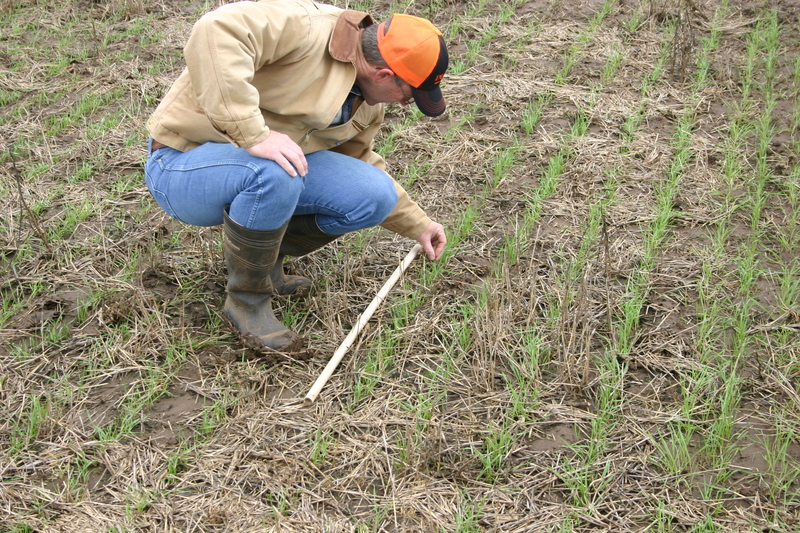 Be sure to look under residue in no-till fields and under clumps of soil in conventional-till fields. Scouting for winter grain mites requires getting close to the soil surface and moving residue to disturb mites. Winter grain mites feed by piercing plant cells in the leaf, which results in “stippling”. As injury continues, the leaves take on a characteristic grayish or silverish cast. Winter grain mites are more likely to cause injury in wheat if it is already stressed due to lack of moisture or nutrients. Also be advised that freeze injury can easily be confused for winter grain mite injury. There are no established thresholds for winter grain mite. 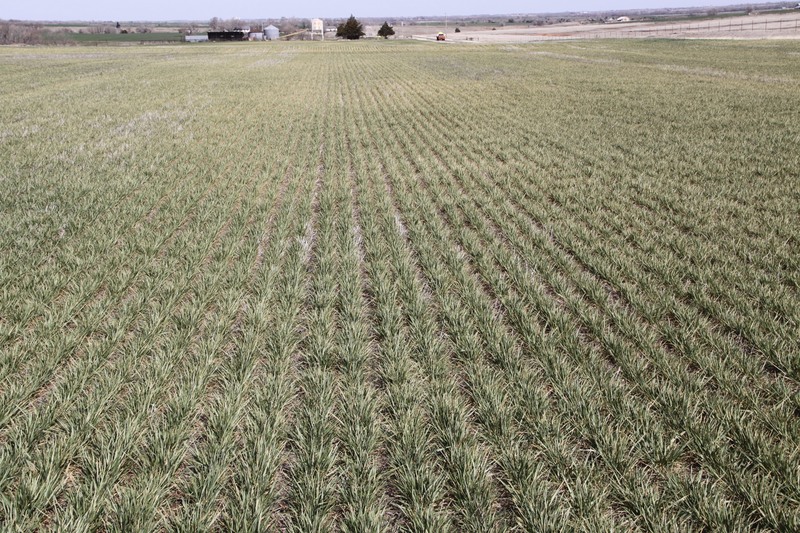 Healthy, well-fertilized wheat plants can generally outgrow injury, so it takes large numbers to justify control. If there is injury present AND large numbers of mites (~10 per plant) present in grain only wheat this time of year, you might consider control. If the wheat is to be grazed, I would simply monitor the situation in most cases and only spray if injury became severe. Malathion is the only product labeled for wheat in Oklahoma that has winter grain mite on the label. There are many additional products, such as some of the pyrethroids and chlorpyrifos, that are effective at controlling winter grain mite, but they don’t have a specific label for them. These products can be applied under 2ee regulations; however since this pest is not specifically labeled, the user assumes all responsibility for the application of the product. It is also important to read and follow label directions regarding grazing restrictions for these and all pesticides. Consult OSU Current Report 7194 Management of insect and mite pests in small grains for a more complete listing of available pesticides. By osuwheat in insects, wheat on January 6, 2015 .